Taking the AP Chemistry exam doesn’t have to be stressful if you review some key material. Help yourself prepare for the AP Chemistry exam by knowing your way around chemistry lab equipment and reviewing common polyatomic ions and rules for significant figures. 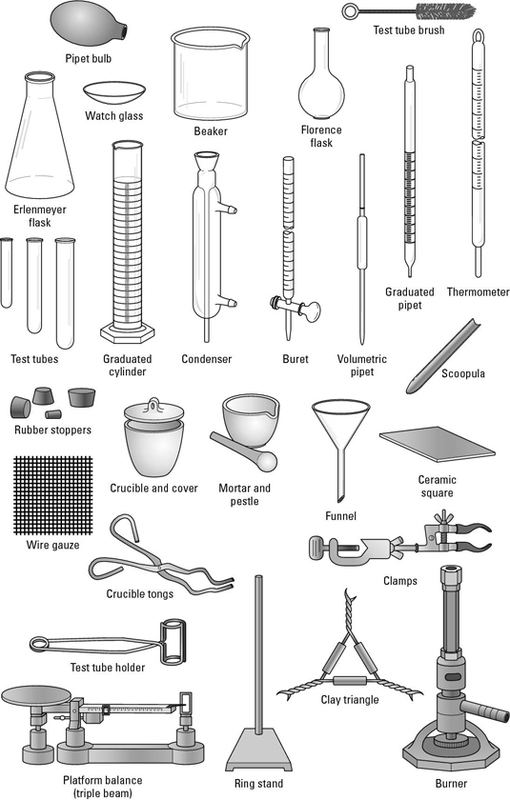 You won’t be directly tested on your knowledge of lab equipment, however the AP chemistry exam will often describe and/or diagram experimental setups so you will need to be able to recognize and understand the purpose of each of the pieces of equipment below. The following figure shows all of the lab equipment that an AP chemistry test-taker will need to be familiar with. Crucible: A cup-shaped container capable of sustaining high temperatures. It is used to heat chemicals. Erlenmeyer flask: Used to hold liquids. The small upper opening slows evaporation, so for some volatile liquids, a flask is a better choice than a beaker. The shape also makes it suitable for mixing and swirling liquids during a titration. Florence flask: A type of flask, generally round-bottomed, usually suspended and heated from below. Its shape makes it easy to swirl and mix liquids inside of it. Thermometer: Used to measure temperatures. Thermometers generally contain liquid mercury.